For chocolate lovers or anyone who loves to eat! You have to try Vosges Haut Chocolat! Something different to indulge in. To see how exotic these are, check out the library of the exotic candy bars! It was definitely an adventure to eat all those candy bars (not all at once!) because each of the flavors have its own character. You’ll like some but you’ll swear some! I do remember that I didn’t particularly like those with chilies (either Oaxaca and Red Fire bar). But then , it’s my experience so I guess, every experience is unique. Honestly? We did it for the few bars but what the heck? We just did what we had to do! Pop into our mouth and there, we got the explosion in our mouth! We just can’t wait to taste all of it! 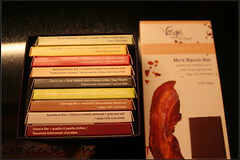 My favorite (I’ll just pick 2 which are not my usual flavors) are Black Pearl and Mo’s Bacon bar. I just love how the flavors got mixed up and complemented each other…ginger, wasabi, sesame seeds, it was just a level higher than my usual Ritter Sport White chocolate with hazelnuts. Mo’s bacon bar was also super! Saltiness (of the smoked bacon) vs sweetness (chocolate, what else?!) fighting inside my mouth that led me to finish the big bar (with the help of my HB) in a few minutes (excuses! excuses!). Wish we could have savoured it longer (breathe…see…smell…snap…taste…feel…) but I doubt if it would last more than a day. Vosges Haut Chocolat is gluten free, dairy-free and fresh Vegan friendly. This entry was posted on Thursday, November 13th, 2008 at 1:05 am	and is filed under Outing, Food Trips. You can follow any responses to this entry through the RSS 2.0 feed. You can leave a response, or trackback from your own site.